Shahid Afridi took his maiden five-wicket World Cup haul as Pakistan crushed sloppy Kenya by 205 runs in a one-sided Group A match played on Wednesday. In reply to Pakistan's total of 317-7, Kenya were bundled out for 112 in 33.1 overs. Earlier, Pakistan, with a little help from a massive extras total, got their batting into top gear in their opening Group A World Cup match against Kenya, reaching 317 for seven wickets on Wednesday. Akmal brothers Kamran and Umar, Younis Khan and Misbah-ul-Haq all made contrasting half-centuries after Pakistan had got off to an unsteady beginning, stuttering to 12-2. Thomas Odoyo was the most successful bowler with figures of three for 41 but he was also responsible for sending down 20 of the 37 wides bowled by Kenya out of a huge total of 46 extras. Their in-form opener Ahmed Shehzad was dismissed for one and his partner Mohammad Hafeez made nine before Pakistan were able to stage some kind of recovery. Kamran Akmal and former captain Younis put together a stand of 98 off 110 balls to get the innings back on track. Kamran scored a steady 55 off 67 balls with five fours and Younis 50 off the same number of balls, reaching the boundary only twice. 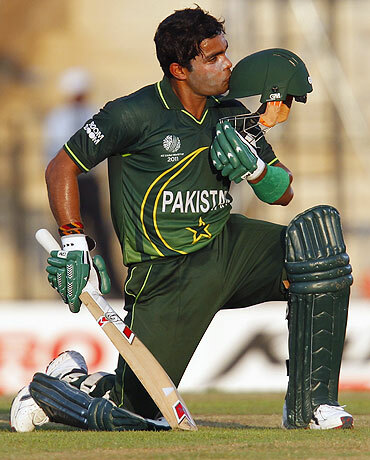 The innings was given momentum by Misbah-ul-Haq and Umar Akmal who added 118 for the fifth wicket off 80 balls. Misbah on his World Cup debut got off the mark with a six off Steve Tikolo and was dropped off the next ball by wicketkeeper Maurice Ouma. He made use of that lapse to hit one more six and a four before holing out to long-on for 65 made off 69 balls. Umar continued to attack the Kenyan bowling and made maximum use of the batting powerplay when 72 runs were scored for the loss of one wicket. His attractive innings ended on 71 when he slogged once too often and was held at long-on. He faced 52 balls and hit one six and eight fours. The Kenyan fielding was ragged at times and allowed Pakistan to gain the upper hand after a slow beginning. First it was the batsmen who carved out an important innings from Pakistan, who have not progressed beyond the first round of the World Cup in the last two editions. And later, it was skipper Afridi who penned the perfect script to end the day on a high. The Kenyan batsmen had no answer to captain Afridi's tantalising leg-spinners as he ended up with figures of five for 16 off eight overs. It was Kenya's second consecutive defeat in the mega-event after being demolished by New Zealand by 10 wickets in their tournament-opener on Sunday. 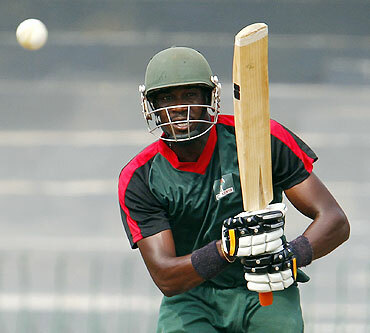 For Kenya only four batsmen reached double figures with Collins Obuya top-scoring with a gutsy 47 off 58 balls. Obuya's impressive 47 runs were inclusive of three sixes and their highest partnership was the 37 runs struck by openers Maurice Ouma and Seren Waters. Apart from Afridi, pacer Umar Gul claimed two Kenyan wickets, giving away just 12 runs. Even though he failed with the bat, skipper Shahid Afridi led from the front while defending the target, picking five wickets for just 16 runs in the former champions' comprehensive victory. Pakistan next play Sri Lanka in Colombo on Saturday.